The RO-300 series comes with many of the same standard features as the RO-200 series, including multimedia and activated carbon pre-filters, water softeners with brine tank, and UV sterilizers. These too can be customized based on individual design to include chemical dosing, cleaning skids, antiscalant and more. These reverse osmosis systems can accommodate between 13,000 to 32,000 GPD, with feed water TDS of 1000 ppm to 5000 ppm. 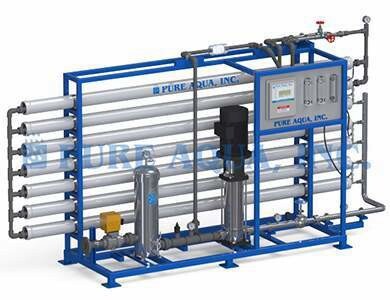 Pure Aqua’s Reverse Osmosis systems are capable of removing salts as well as other impurities such as bacteria, sugars, proteins, dyes and constituents having a molecular weight greater than 150-250 Dalton.